I've been looking for these for a few years. They showed up in Asbury Park two days ago. Well isn't this crosswalk something! Look at that! I'm so happy you've discovered another part of the Sixth Borough Frankie! Good for you! Thanks Frankie, I really appreciate your comment. I have to say, it's a relief finding this thing, I was looking for it for quite some time. Glad you said it and not me. I only have so many compliments to go around before I run out. You'd think that the 1687 people who read the shlog everyday would say something about the crosswalk? I am still processing this crosswalk. Hence the lack of comments. the lines are well defined and rather sharp. Like good cheddar. But there is something irking me about the color selection. Not in a bad way, just.... somethings not quite right. Like the small piece of broccoli that gets wedged in the teeth, or the eyelash in your eyeball that doesn't hurt but just irritates. Or when that rouge hair just wont stay down no matter how much you comb and style your hair. It's getting to me.... Damn cowlick. Don't front on stale wedding cake. I find that it tastes better when you pour melted butter on top. moistens it up a bit. 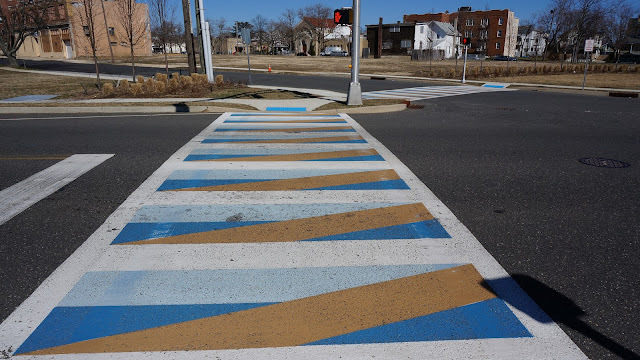 Also that crosswalk seems like it should be moving. It's an optical illusion it is!